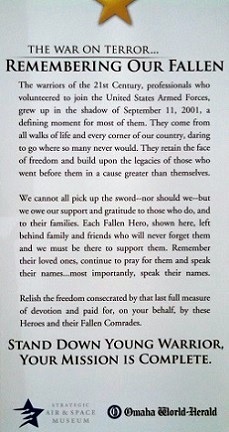 Two items I saw that are worth reflection on 9/11. I have reproduced the words in case the pictures are not readable. 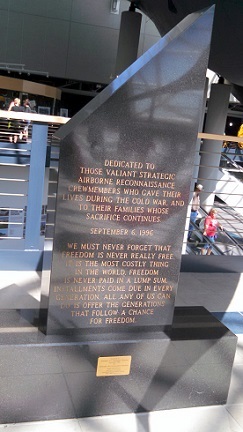 We must never forget that freedom is never really free. It is the most costly thing in the world. Freedom is never paid in a lump sum. Installments come due in every generation. All any of us can do is offer the generations that follow a chance for freedom. The warriors of the 21st Century, professionals who volunteered to join the United States Armed Forces, grew up in the shadow of September 11, 2001, a defining moment for most of them. They come from all walks of life and every corner of our country, daring to go where so many never would. They retain the face of freedom and build upon the legacies of those who went before them in a cause greater than themselves. We cannot all pick up the sword -- nor should we -- but we owe our support and gratitude to those who do, and to their families. Each Fallen Hero, shown here, left behind family and friends who will never forget them and we must be there to support them. Remember their loved ones, continue to pray for them and speak their names ... most importantly, speak their names. Relish the freedom consecrated by that last full measure of devotion and paid for, on your behalf, by these Heroes and their Fallen Comrades. Rocky Mountains behind us and morning sun in our eyes. We are on the road headed east. This morning we ended our stay with Adam, Amy, and the boys in Highlands Ranch, CO and resumed our summer 2015 journey. We helped them get through a difficult housing relocation and enjoyed an extended visit getting to spend a lot of time with our three grandsons Andrew (10), Joshua (8), and Benjamin (6). Besides packing and unpacking a lot of boxes, we attended many soccer games, Michelle played uncountable games of Uno, and I "helped" Joshua write a story. This was the first time we were there to celebrate all three birthdays. 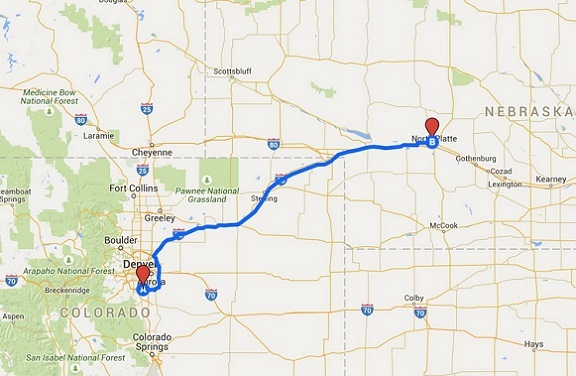 Today's journey was an easy (read "flat") 285 miles northeast on I - 76 then east on I - 80 to North Platte, NE. Travel time was about six hours and we lost an hour going from Mountain Time to Central Time. 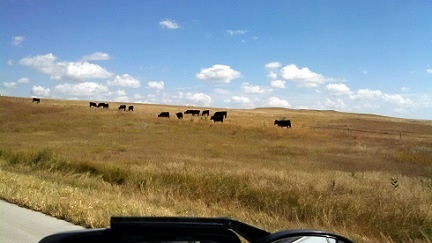 Eastern Colorado was uneventful with only a few cows to keep us company. 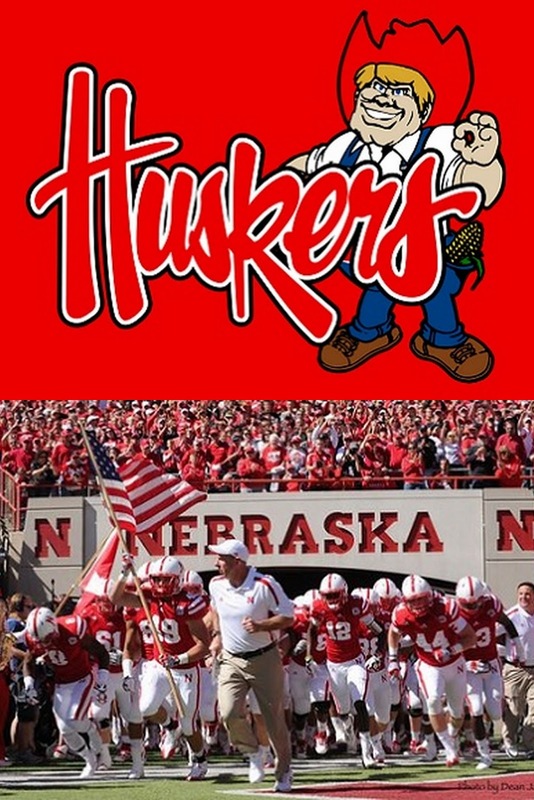 In Nebraska, the scenery changed dramatically as we entered Cornhusker territory. 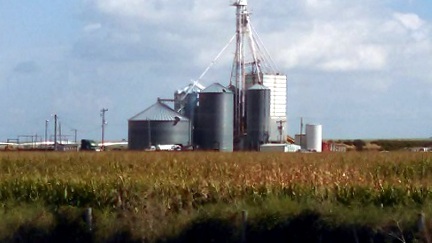 The landscape is endless fields of corn punctuated by silos. Small towns (very small) focus around giant Grain Elevators. Out here, trains seem to be a million miles long and you can see every inch of them. Our destination today was North Platte, NE. We got there about 4:30 PM; too late to visit the museum ... maybe tomorrow. 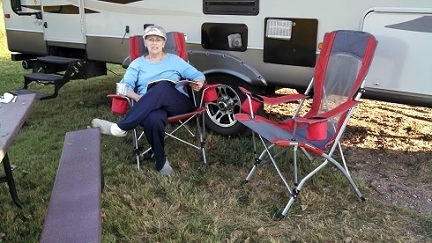 ... and enjoyed our new chairs – a gift from Adam and Amy. Thanks. 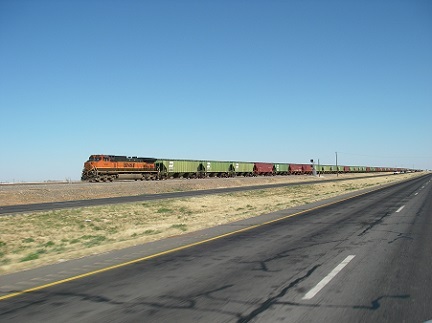 North Platte is a railroad town; Union Pacific Railroad's large Bailey Yard is located within the city. Today, North Platte is served only by freight trains, but during World War II the city was famous for the North Platte Canteen. Several thousand volunteers from North Platte and surrounding towns met the troop trains passing through North Platte, offering coffee, sandwiches and hospitality. North Platte is home to the world's largest rail yard, Bailey Yard. The Golden Spike Tower and Visitor Center is an eight-story building which overlooks the expansive railroad staging area. The tower and visitor center are open to the public year-round. 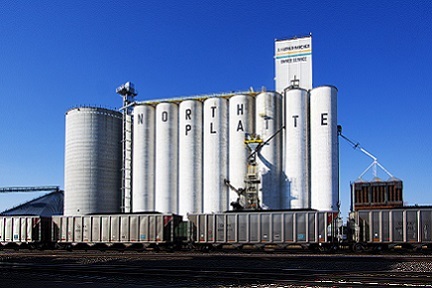 North Platte was the Union Pacific Railway's western terminus from the summer of 1867 until the next section to Laramie, Wyoming, was opened the following summer. 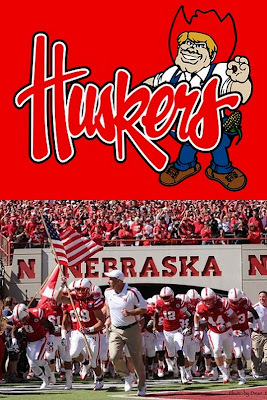 Even though Congress had authorized building the Transcontinental Railroad in 1862, it was only extended as far as Nebraska City by early summer of 1867. 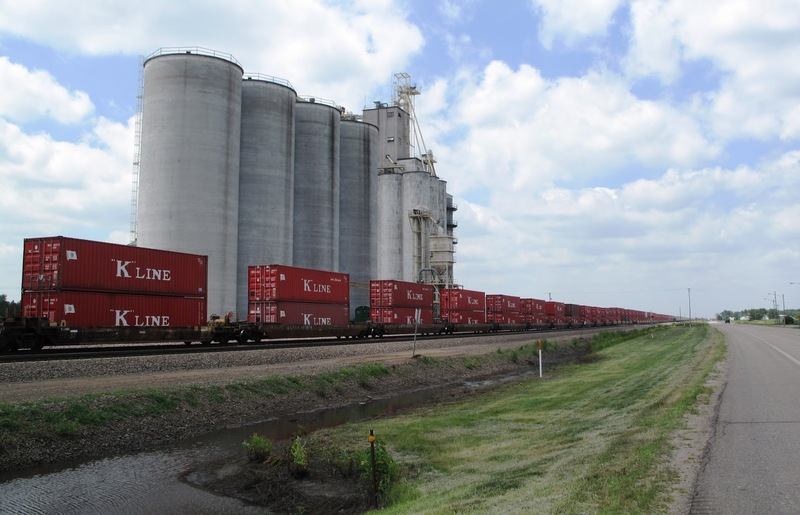 The 275-mile section from Nebraska City to North Platte was completed in less than six weeks. Lincoln County Historical Museum contains a display detailing the history of the North Platte Canteen, which greeted 6.5 million service personnel from Christmas Day 1941 through April 1, 1946. It also contains a Prairie Village with local landmark homes and other buildings, including a Pony Express station and pioneer church among many others. Buffalo Bill Ranch State Recreation Area is located next door to the Historical Park, which makes it easy to tour the ranch house and barn that Col. William F. "Buffalo Bill" Cody built for his home in North Platte during the heyday of his famous Wild West Show. Cody owned some 4,000 acres here, which were appropriately named Scout's Rest Ranch. The park encompasses 25 acres of the original ranch, including the house and barn. Part of Buffalo Bill State Historical Park, this state recreation area offers camping pads with electricity, primitive sites and a group picnic shelter. NO WATER, NO SEWER. Buffalo Bill Ranch State Recreation Area is a convenient stop off I-80 at the North Platte Interchange. 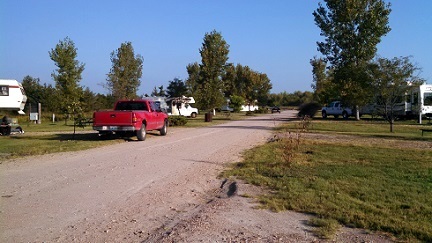 The recreation area offers fishing, picnic tables, fire rings, and hiking trails. When I told Joshua (the eight year old) we were staying at Buffalo Bill Ranch, his response was "The Buffalo Bills have a ranch??". Like beauty, I guess history is in the eye of the beholder.